Titans, Axis and a Scrap Merchant. All The Anime bring us a real classic anime in the guise of this release. 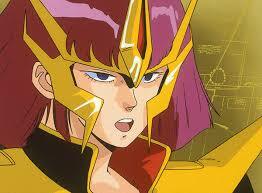 Mobile Suit Gundam ZZ has pleased kids and adults alike with the exploits of the AEUG battleship Argama. Now on Blu-ray it is one to add to the Gundam shelf in your home. 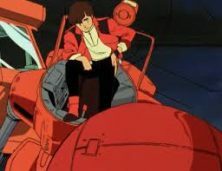 Directed by Yoshiyuki Tomino (Mobile Suit Zeta Gundam) he brings us a lighter series than the previous two incarnations of the Gundam series, but there is still plenty of fighting and subsequent deaths. The Battleship Argama is limping away from the final battle with the Titans and Axis. It took heavy damage and the casualties were heavier. The captain Bright Noa (Hirotaka Suzuoki, Dragon Ball Z) decides that the best place to get repairs is at the oldest of the space colonies Side 1 named Shangri-La. Side 1 being the oldest has seen better days and after all the fighting in the war a lot of it has fallen into disrepair. Judau Ashta (Kazuki Yao, One Piece) is a young man who should be at school but his parents have moved to another Side to get work and he has been left an allowance for himself and his younger sister Leina (Maya Okamoto, Heaven’s Lost Property). It is not enough and instead of going to school he and his friends collect scrap for cash. Whilst outside of Shangri-La Judua finds an old escape pod and he thinks it will bring him a pretty penny, as he is collecting it he spies the Argama approaching Side 1. When inside his so called friends Beecha (Shingo Hiromori, Gunslinger Girl) and Mondo (Kozo Shioya, Bleach) claim the prize and when they open it they get a bigger surprise, there is a pilot alive inside who persuades the group to go after a prize on the Argama, a Gundam Zeta. After stealing an army truck and kidnapping a girl who was driving an ambulance, Judua checks in the back and finds a comatose man who comes around. He lifts his hand, Judua takes it in his and a strange Newtype thing passes between them before they head on-board and Judua heads for the hanger bay with the pilot. This where things turn nasty as the pilot tries to get the Zeta off of Judua and reveals that he is an enemy Titan. Not knowing the controls he is clumsy as the pair are soon inside the colony as the Titan steals another Mobile Suit and the two thrash it out until Judua defeats him and manages to escape the authorities. 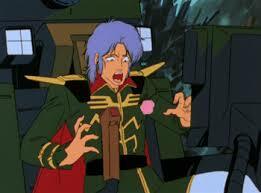 But Judau wants that Mobile Suit and he keeps trying to get it. A briefcase arrives on Side 1 and it is full of gold and it is payment from the Neo Zeon ship Endra affiliated with Axis, the Argama’s enemy, who want to dock at Shangri-La. With the officials eyes light by gold they agree. one of the underlings goes and warns captain Bright and offers to help by towing the Argama into the colony and out through a back door. Pilot Captain of the Axis cruiser, Mashymre Cello (Kenyu Horiuchi, Magi: The Kingdom of Magic) is a honourable soldier and doesn’t want civilians harmed but he also wants the Zeta and will do so for the love of their leader the Lady Haman (Yoshiko Sakakibara, Psycho-Pass). 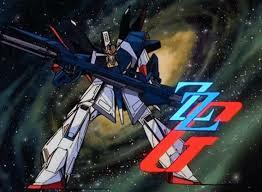 With Mecha, fights, Laser Swords, Treachery and Desperation, Mobile Suit Gundam ZZ has it all even the new Gundam ZZ. 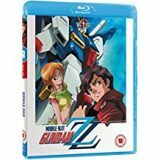 Mobile Suit Gundam ZZ is Available on Blu-ray.